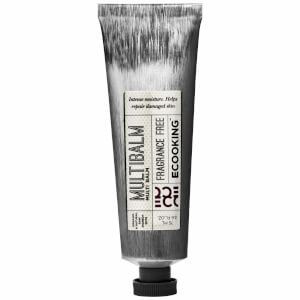 Nourish and repair with the Multi Balm from Ecooking, a Danish skincare range that utilises organic and natural ingredients for maximum effect. Enriched with Shea Butter, Thistle Oil and antioxidant Vitamin E, the multi-tasking miracle balm melts effortlessly into dry or sensitive skin to soothe and comfort. Deeply moisturising and hydrating, the multi-purpose balm can be applied to dry areas, cracked lips, insect bites and cuticles to restore and regenerate. Use on the face or body. Apply to dry or troublesome areas. If you have extremely dry skin (e.g. elbows, hands or face), apply balm in a thin layer and let work overnight. Butyrospermum Parkii Butter*, Glyceryl Rosinate**, Ricinus Communis Seed Oil**, Rhus Verniciflua Peel Cera/Rhus Succedanea Fruit Cera**, Prunus Amylgdalus Dulcis Oil*, Olea Europaea Oil Unsaponifiables*, Cera Alba*, Olea Europaea Fruit Oil**, Argania Spinosa Kernel Oil*, Ascorbyl Palmitate, Tocopherol**, Aqua**, Glycerin*, Pseudoalteromonas Ferment Extract, Xanthan Gum, Proline, Alanine, Serine, Sodium Phosphate, Sodium Hydroxide, Caprylyl Glycol, Ethylhexylglycerin, Butylene Glycol, Citric Acid, Acetyl Hexapeptide-49.